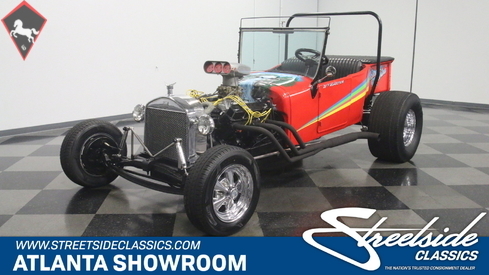 General description : MOPAR 440 V8, LONGTUBE HEADERS, 4BBL, TORQUEFLIGHT, CUSTOM PAINT, LOTS OF FUN!! 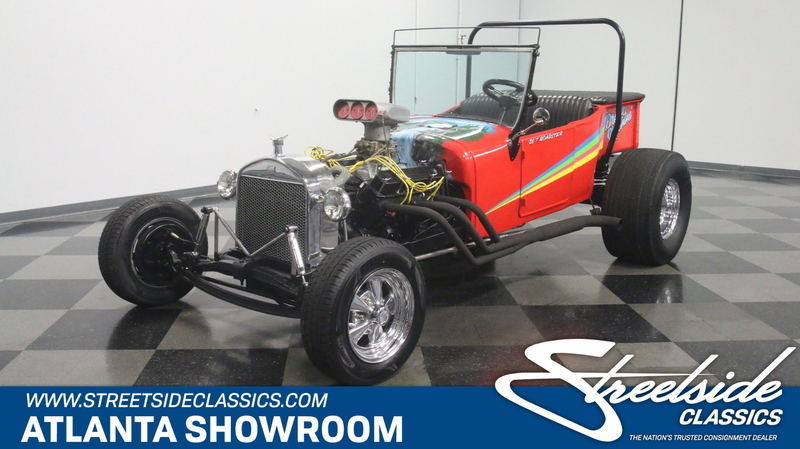 The look is perhaps the most instantly-recognizable hot-rod of all time, equal parts cartoon and serious performance threat, and the abbreviated Model T roadster pickup body has a few styling cues to let you know its origins. Painted in bright red with cool vintage '70s airbrush work, this one stands out simply because it looks like it was there when it all started. The paint shines reasonably well and while it's not show-quality, it's quite presentable and does nothing to diminish the fun that the T-bucket represents. It's got a clean, simple, no-nonsense look, as if the essence of the minimalist T-bucket was bared down even farther, leaving just the basics. You'll note the front end was stretched a bit to handle the big block Chrysler V8 and there's a familiar Model T radiator shell out front. Out back, the abbreviated pickup "bed" has been finished with a pseudo tonneau cover, and the mural back there is a familiar glimpse into what makes this hobby so great. The interior is, of course, minimalist, but the black pleated vinyl is durable enough to survive out in the elements. I suppose it's technically a bench, but it, too, is minimalist, and you'll have to brace yourself to stay planted behind the Grant GT 4-spoke steering wheel. A full complement of instruments in the dashboard show you what's going on up front (well, the things you can't see, anyway), and a slightly raked column makes for a far more comfortable driving position than most T-buckets. You'll also spot a driver's door, which makes getting in a lot easier than most Ts and even the stripes wrap into the jambs, so this paint job wasn't a cheap one back in the day. There is no stareo to overcome the side pipes so you'll have to get used to running alfresco and there is no top. That's the T-bucket way. A 440 cubic inch Chrysler V8 provides motive power, and since it's out in the open like that, the 440 is dressed up for show. Finned Mickey Thompson valve covers are a traditional touch matched by a towering scoop-style air cleaner and a block painted black to match the chassis, so it blends right in. 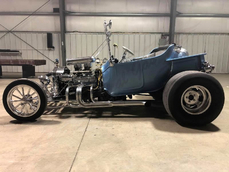 There's a mild cam inside, an Holley 4-barrel carburetor and Edelbrock intake, and those long-tube headers and side pipes that are part of the T's DNA, so it runs well enough to need all that rubber out back. A quick-shifting TorqueFlite 3-speed automatic drives a narrowed Ford 9-inch rear end, which shrugs off the big block's torque. The front suspension uses a dropped I-beam front axle and a leaf spring to hang it waaaay out there, giving the T a rather sleek look. Shiny Cragar mag wheels look vintage and wear traditional skinnies up front and giant track-style meats out back. 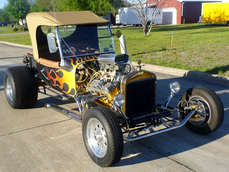 1926 Ford T-Bucket 440 V8 is listed for sale on ClassicDigest in Atlanta, Georgia by Streetside Classics - Atlanta for $15995.